TRUMP WANTS TO TAKE 30 MILLION AMERICANS OFF THEIR HEALTH CARE PLAN - THE OBSCENE CONTINUES! "Injustice anywhere is injustice everywhere"
The GOP - Not One of US. Business in the USA is sitting on $2 trillion dollars refusing to invest their own funds in expanding and hiring workers. When one adds to this the reserves that banks, equity firms and hedge funds have - the picture is clear - "capitalism in the USA is on strike." The engine of our economy - the spirit of entrepreneurship is not in evidence today. So much for business being dynamic and risk taking. They hire K- Street lobbyists and their ilk at the state level because they are averse to risk taking - pleading for tax breaks, tax credits and endless loopholes. The "business of business" in America today is not about job creation, it's about wealth hoarding and redistribution from the middle class to the top 1%. So for those who claim government doesn't create jobs, my response is that business doesn't either until given "corporate welfare" by government. The fact is that the private and public sector are highly integrated, something the anti-tax, anti-government Tea Party types don't understand. Job creation requires public/private partnerships but the benefits of such collaboration should go to the 99% not just the 1%. She flies with her own wings! The Oregon story - the rich get richer, the poor and middle class lose ground. Check this front page Oregonian article out. Oregon's coming 34th out of 41 states in the Obama "Race to the Top" illustrates the failure of leadership from Governor Kitzhaber and his predecessors as they have built an educational bridge to nowhere called high stakes testing. Instead of being in a race to the top we seem to be dumpster diving to the bottom despite doing education reform since 1991. Insanity is termed doing the same thing over and over again. When can we put a fork in this stupidity? To confuse matters more the Oregonian's editorial board has pontificated that this was a lost opportunity to get federal funding for innovation. How firing principals and teachers equals innovation is a mystery to me. The way to reform schools is to reduce class sizes, to encourage teacher collaboration and to support their continued education. High stakes testing and performance based assessment of teachers are NOT the answer! If you want students to succeed you first have to resolve the issues they confront before they come to school. Children who face poverty, hunger, homelessness, health care issues and family instability require wrap around services for them and their families, 24/7. Every child needs a safe home of their own and parents who know how to be good parents. There is only one way to address this impending crisis. Schools must have a stable source of funding. Until that happens - we will limp from crisis to crisis. Why does the richest nation in the world have the moral blight of homeless people? • The faces of the homeless are families with children, single men and women, vets, and many who are impaired. It is estimated that in Washington County up to 56% of homelessness occurs to families. • Hunger is highest among single mother households (10%) and poor families (15%) as well as renters, unemployed workers and minority households. Trump's role models are Vladmir Putin and Benito Mussolini. He has contempt for our checks and balances system. He wants to "rule" not govern like a strong man, a despot. He will shredd the Constitution anytime he feels the urge to do so and like all despots he only listens to his inner circle. And he is paranoid and narcissistic. "There are men who believe that democracy... is limited or measured by a kind of mystical and artificial fate [and that] tyranny and slavery have become the surging wave of the future..."
"I'm not a teacher: only a fellow traveler of whom you asked the way. I pointed ahead – ahead of myself as well as you." "Although we may never know with complete certainty the identity of the winner of this year’s Presidential election, the identity of the loser is perfectly clear. It is the Nation’s confidence in the judge as an impartial guardian of the rule of law." "Great is the guilt of an unnecessary war"
"Loyalty to country always. Loyalty to government when it deserves it." "The love of one's country is a natural thing. But why should love stop at the border?" "Things fall apart; the centre cannot hold; mere anarchy is loosed upon the world, the blood-dimmed tide is loosed, and everywhere the ceremony of innocence is drowned; the best lack all conviction, while the worst are full of passionate intensity." "...the most common and durable source of factions has been the various and unequal distribution of property. Those who hold and those who are without property have ever formed distinct interests in society... The regulation of these various and interfering interests forms the principal task of modern legislation, and involves the spirit of party and faction in the necessary and ordinary operations of the government..."
The legitimate object of government, is to do for the people whatever they need to have done, but which they can not do, at all, or can not do, so well, for themselves – in their separate and individual capacities … There are many such things … roads, bridges and the like; providing for the helpless young and afflicted; common schools … the criminal and civil [justice] departments." "Parliament is not a congress of ambassadors from different and hostile interests, which interests each must maintain, as an agent and advocate, against other agents and advocates, but Parliament is a deliberative assembly of one nation, with one interest, that of the whole..."
A RAD rhetorical question - Were Madison & Marx "Marxists"? "History records that the money changers have used every form of abuse, intrigue, deceit, and violent means possible to maintain their control over governments." Fortunately for the republic, President Donald Trump and his minions can’t even do an end-zone dance right. And their celebration, by the way, is wildly premature. from the clutches of Trumpism was always going to require a broad popular consensus. Democracy and elections remain the best ways to create it. They cannot let Republicans, who devoted such energy under President Barack Obama on harebrained investigations, now tell House Democrats that accountability is off the table for the next 20 months. They cannot fall silent as the press is denounced (sometimes, sadly, by other members of the media) for publishing stories about Trump that were 100 percent true. Editor's Note: Communicating via tweets is problematic, especially for a newly minted Congresswoman. But were Omar's comments "anti-Semetic?" I don't think so... If critizing Israel or acknowledging the existence of the Jewish lobby in the USA is anti-Semitic then the term has lost its meaning. But governing via tropes is problematic as the Congresswoman has discovered. One would have thought watching Trump do this was enough to take her fingers off the keypad. Aipac doesn't fund congressional campaigns but its members and friends do... and it lobbyies Congress on a pro-Israel platform. While I didn't grow up in Minneapolis or St. Louis Park I spent 5 years in grad school at the U of M in the Twin Cities and had many a good meal at one of the great delis in St. Louis Park. 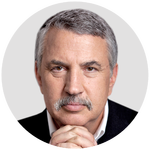 I share much but not all of Thomas Friedman's views below. Clearly Representative Iihan Omar should take a more nuanced view of our Israel/Pelestinian problem. But unlike Friedman, I think Israel, under its current leadership, is a sponsor of state terrorism in the way it treats the Palestinian people and also one of the top merchants of death as an arms trader. Like Iran Israel gives people like Omar reason to vent though it is viwed as being politically incorrect and within the Democratic party divisive. I hope she learns to modulate her views but not necessarily change them. I think the claims of assumed "dual" loyalties is a disengenous game to play by all sides. As a nation of immigrants it's not uncommon for immigrants to come here with a hope of returning to their homeland and/or helping their families left behind. But this doesn't make them less "American" - it simply means they navigate a political terrain that is more complicated than Trump's "America First" rhetoric. As generations of immigrants remain here the loyalties of successive generations is unquestionnable and deeper as Americans. As a life long Democrat and member of an extended family which includes Japanese-Americans, I find it ironic and tragic that a Democratic Preisdent, FDR, signed EX 9066 which resulted in the internment of over 120,000 of Japanese ancestry on the West Coast without a shread of evidence of disloyalty to the USA. But if one reads the order it also included references to Italian and German Americans as well but they were not rounded up although German Americans were systematically marginalized in WW I. As a Somali American Representative Omar was elected by a community in the 5th Congressional District which has an illustrioua history of supporting progressive values. Let's hope the good representative has learned her lesson - which was the point of the House Majority's resolution condeming bigotry in whatever form. On the eve of the 2020 election Democrats don't need to divide up into their ethnic silos and give Trump breathing space. But let's not forget that Isreali's occupation of the West Bank and continiuing to build setttlements on the West Bank is like poking at an open wound. We need a more balanced position via a vis Israel and Palestine. If Omar's rhetoric reminds us of that open wound then her not carefully chosen words can be a source of long term healing. I’ve been watching with more than a little interest the controversial statements about Israel and the Israel lobby by Ilhan Omar, a freshman Democratic congresswoman from the Fifth District of Minnesota, because it turns out that we have a lot in common — up to a point. I still feel very close to the community there and go home often. St. Louis Park welcomed Jews who wanted to get out of the inner city of Minneapolis back in the 1950s — when other suburbs still had restrictions on selling homes to “Hebrews.’’ So I was proud to see St. Louis Park also welcome Muslim Somali refugees like Omar a half-century later, and then elect her to Congress. The other thing that Omar and I have in common, as others have noted, is that we both don’t like the American Israel Public Affairs Committee (Aipac) — the organization at the center of the Israel lobby — and have spoken in very blunt language about its strong-arm political tactics. RAD: Aipac has become a tool of the current Isrealis regime. They should be registerred as a foreign agent with the State Department. But that is also where our differences begin. I don’t like Aipac because I strongly believe in the right of the Jewish people to build a nation-state in their ancient homeland — a nation-state envisaged by its founders to reflect the best of Jewish and democratic values. And I believe Aipac for many years has not only become a rubber stamp on the right-wing policies of Prime Minister Benjamin Netanyahu, which has resulted in tens of thousands of Israeli settlers now ensconced in the heart of the West Bank, imperiling Israel as a democracy. Aipac has also been responsible for making support for Israel a Republican cause, not a bipartisan issue, which poses a real danger to Israel’s support in America in the long run, and particularly on college campuses. I dislike Aipac because I am devoted to Israel as a Jewish democracy and because I believe that only a two-state solution between Israelis and Palestinians can ensure that. Given how Aipac has let itself become the slavish, unthinking tool of Netanyahu, who opposes a two-state solution, I believe Aipac works against Israel’s long-term interests. Aipac is a self-appointed lobby that does not represent my feelings as an American Jew. But neither does Representative Omar. Everything I have heard from her leads me to conclude that she dislikes Aipac because she dislikes Israel, because she does not really believe the Jewish people have a right to an independent state in their ancestral homeland. She seems to support the Boycott, Divestment and Sanctions movement against Israel, known as B.D.S. RAD: I support the boycott... just as I oppose Apartheid in South Africa - why does that mean one doesn't support Israel's right to exist? Friedman's logic here escapes me. When Omar was asked at an August primary debate held in a St. Louis Park synagogue about her stance on B.D.S., she said that the movement was “not helpful in getting that two-state solution,” Haaretz reported on Nov. 14. According to Haaretz, her campaign confirmed that she had voted against an anti-B.D.S. bill while she was a member of the Minnesota House of Representatives, explaining that she was inspired by how B.D.S. had worked to undermine apartheid in South Africa. “I don’t want to be part of a vote that limits the ability of people to fight towards that justice and peace,” she had said. RAD: Sounds fair to me! By being specific about the rights of Palestinians to return to their home and not unequivocally committing to a two-state solution, the movement leaves me and many others to believe that B.D.S. is just code for getting rid of the state of Israel. I do not believe in passing laws against B.D.S. — people can boycott whomever they want — but I do believe it is not a helpful movement at all. And I believe Omar’s waffling on the issue, depending on her audience, is equally unhelpful and troubling. If she thinks the only reason that Americans support Israel is because of Aipac and campaign contributions, she is dead wrong. Americans’ affinity with Israel is rooted in a respect for Israel’s ability to maintain a democracy, albeit with flaws, in a sea of autocratic regimes; it is rooted in a Judeo-Christian religious affinity; and it is rooted in respect for Israel’s contributions to technology, medicine and science. Aipac is the beneficiary of that support, not the cause of it. RAD: Come on Tom - as it exists today Israel is only in a pro forma way a "democracy." Our affinity to Israel is complicted and deeply rooted in our own nation's guilt over home grown anti-Semitism and memories of WW II whan we didn't allow Jews to immigrate to the US and were holocaust deniers even late in the war. We use Israel, as the Brits did in WW I, as a geo-political foil in the Middle East not because she is a democracy. But Aipac has abused that privilege. And it is utterly fooling itself if doesn’t understand that there are more than a few Americans, especially on college campuses but not only there, who are enjoying watching Omar give it a punch right in the face. She is saying something others want to say but are afraid to do so — including some members of Congress, I am sure. Why? Maybe it’s because they watched how President Barack Obama put together a $40 billion, 10-year military aid package for Israel — a high-tech powerhouse that is not poor — and rather than receiving effusive thanks from Netanyahu, Obama was criticized by Bibi and his cat’s paw, the Republican Senator Lindsey Graham, as “not generous enough,’’ because it required that aid to be spent purchasing American arms, benefiting our workers, not on Israeli-made arms. Aipac went along with Netanyahu’s ungratefulness. With Aipac’s support, Netanyahu also got the Republican House to invite him to give one of America’s highest honors — a speech to a joint meeting of Congress — over the objections of President Obama. Netanyahu used the opportunity to castigate the White House at the height of both the Iran negotiations and Netanyahu’s own re-election campaign. That really made me mad as an American. Netanyahu used our Congress to attack our president and further his re-election campaign. No other foreign leader would have dared to do that. RAD: Aipac and the GOP acted like foreign agents on Bibi's behalf. Bibi is throughly disgusting and maybe a crook. Shameful. Around 60 Democrats boycotted the speech, saying it was an overreach by Speaker John Boehner, Netanyahu and Aipac — one also designed to make it look as if Republicans were more pro-Israel than Democrats. According to Talking Points Memo, the Israelis and Republicans worked out the details of Bibi’s congressional speech “without notifying the White House,” so that, Boehner said, “there was no interference” from the administration. Not only did that violate diplomatic protocol — an opposition party working directly with a foreign government — but of political protocol as well, with congressional Republicans developing their own foreign policy independent of, and at odds with, the White House. RAD: "working directly with a foreign governmnt..." Sounds familiar? When I see that dual-loyalty charge coming from a congresswoman who first signaled opposition to B.D.S. and then support for it, when I see it coming from a congresswoman who has never been to Israel, when I see it coming from a congresswoman who, to my knowledge, has never criticized the Palestinian leadership for its corruption and failure — time and again — to seize on peace overtures from Israeli leaders who, unlike Netanyahu, actually wanted to forge a two-state solution, when I see it coming from a congresswoman who seems to be obsessed with Israel’s misdeeds as the biggest problem in the Middle East — not Iran’s effective occupation of four Arab capitals, its support for ethnic cleansing and the use of poison gas in Syria and its crushing of Lebanese democracy — it makes me suspicious of her motives. RAD: Give her time Tom, she's only been in DC for 3 months! So let me end where I started. Ilhan Omar represents, among other neighborhoods, a significant and liberal Jewish community — my hometown. I can tell you that a vast majority of Jews there would be proud if their congresswoman used her links to American Jews and Muslims to be a bridge builder for peace in the Middle East and America, not just another Aipac/Israel basher. She is young and very new to the national spotlight. Friends of mine back home tell me her humanistic instincts are impressive and authentic. I don’t know if it’s her or her advisers, but she’s gotten herself into a bad place — a huge missed leadership opportunity. Which only reinforces a fundamental rule I have: I love the Israelis and the Palestinians, but God save me from their American friends. When they recreate and fuel their conflict here in America, and on college campuses, they only sow more division, distrust and make things worse. And that’s the last thing the good people in Israel and Palestine need. RAD: Yes, the Israel/Palestinian issue is very divisive. But also keep in mind Omas is not only a Muslims, in American society she is Black too and tensions between Jewish and Black Amercans are there as is a history of collaboration. Let's hope she learns how to walk and talk at the same time... She is a freshman after all. Editor's Note: "If it looks like a duck, walks like a duck and quacks like a duck, it must be a duck." Michael Cohen on the record in Wednesay's hearing - Trump "is a racist, a con man and and chear." End of discussion? His supporters are another issue... some are and some are not bigots. But the real issue is not whether Trump is a racist (I think he is) but whether his actions as a develper, a candidate and president are "racist" - which they clearly are. And let's not forget "words" are actionable - especially when a major public figure legitimizes racism in his rhetoric. But again, deciding which of his base are "deplorables" is another kettle of fish. I think it's wise for Democrats not to label Trump's base except as clearly angy anf fearful... and ignorant. Many of them are along for the ride because they see Trump as a vehichle for turning Roe v. Wide on its head. There was a time (only a year or so ago, perhaps) when President Donald Trump’s critics would shy away from calling him a racist. His statements — equating neo-Nazis with counterprotesters, referring to African countries “s---hole countries,” labeling Mexican immigrants as rapists, etc. — were racist, they’d say. But they would hesitate in labeling the president a racist, preferring to insist they could not “know what’s in Trump’s heart.” That never seemed plausible given Trump’s record going back decades to litigation over the Trump company’s exclusionary hiring practices and his vendetta against the Central Park Five — even after they were exonerated by DNA evidence. If not a racist, he gave a perfect imitation of what one would say and do, over decades. He told us what was in his heart when he fanned the flames of birtherism and kept up a drumbeat of racist remarks throughout the campaign (e.g., “a textbook case” of racism as then-Speaker Paul Ryan called Trump’s accusation that a judge of Mexican heritage could not do his job fairly). After Omarosa Manigault Newman was fired, Trump had no African- Americans among his senior White House staff. His racism is so apparent to many Americans, Democratic presidential candidates now say without batting an eye that “I don’t think you can reach any other conclusion,” as Sen. Kamala Harris, D-Calif., did during an interview with the Root. This is another one of those moments when one must be reminded this is not normal. We’ve had presidents whose policies and positions on racewere roundly criticized, but never has it become unexceptional, uncontroversial even, to call the president a racist. Perhaps candor is healthy, and affording Trump the assumption of good faith does the country no favors. The widely accepted view among Democrats and independents that Trump is a racist, however, raises some of the problems that arose during the 2016 campaign. However, bluntness has its drawbacks and Democrats should consider where the conversation will go from there. What, for example, do Democrats call the voters who supported Trump in 2016, when many (but not all) of Trump’s racist utterances were already out there? Some would argue that Hillary Clinton made the Kinsley Gaffe — inadvertently speaking the truth in public — when she called Trump supporters (or some of them) “deplorables.” It was not however a winning political strategy. Trump supporters understandably refuse to confess to being racists or condoning racism; they’d prefer to insist however unconvincingly that the president isn’t really a racist. Voters don’t want to be told they made a mistake, let alone be told they made a mistake by willful blindness to racism. In 2020, Democrats who flat-out call Trump a racist, no matter how justified they may be, better be prepared to say whether they think Trump’s supporters are racists or unduly tolerant of racism. They might genuinely think the answer is yes, but they’ve then created an unbridgeable divide between “those people” (the racists) and the rest of us. Talk about cementing division and resentment. Some day we will be in the post-Trump era, faced with the challenge of picking up the shards of a shattered political system in which mistrust and even hatred are the default settings for many voters. We will have to figure out how to go forward as country. It, therefore, might behoove candidates to let voters draw their own conclusions about Trump and then present a message of unification instead of vilification. The oldest maximum in our republic is that "what a President proposes, Congress disposes." In other words, the Congress not the President has the "power of the purse." Unless the President gets congressional authorization through the appropriations committees of both Houses, such unilateral action is DOA - dead on arrival, or in this case before! So Trump faces multiple challenges to get his way: 1) his party controls only the Senate, not the House; 2) any such declaration will be tested in the courts no doubt ultimately before the Supreme Court. President Harry Truman in 1952 tried to nationalize the American steel industry at the height of the Korean war - the Supreme Court nixed that act in the bud. Nixon tried to impound funds directing them to his not Congress's stated policies - again he lost in the courts. Reagan used funds to assist the pro-US Contras in Nicaragua without congressional approval. This resulted in the Iran Contra scandal. The President clearly does not comprehend or care that ours is a system based on checks and balances and the rule of law. As a bully he thinks he can get his way simply by saying it. That's not the case. This is another of many examples of his willingness to abuse his power. Trump will no doubt face multiple law suits from the local, state and federal level challenging his rhetoric. But let's not dwell on the obvious, let's take the Bully at his word. He's going to "divert" already appropriated money from the defense Department and Homeland Security to build his Wall, one he promised in his 2016 campaign hundreds of times would be paid for by Mexico. And now he's upped the ante asking not for $5 billion plus but for $6 billion plus to build his Trojan Horse of a Wall. That cannot all come from Defense or Homeland Security he must dredge the federal budget across the board from other programs. As they say "follow the money" who will be sacrificed on the altar of Trump's failed promise that Mexico will pay for the Wall? There comes a time when we must tell it like it is - "the emperor has not clothes." The "Resistance" must stand up to Trump in the streets, in the Halls of power and across the country to stop this intended abuse of presidential power. This week members of Congress will be in their home districts, it's time they heard from their constituents loudly and clearly. We are beyond business as usual. Donald Trump is a clear and present danger to our Republic. Editor's Note: Is the progressive wing of the Democratic Party going to control the message in 2020? The reclaiming of the FDR New Deal legacy is a reminder of what the country needs to embrace but when FDR was elected for his first term he ran on a "balanced budget" plank not the "soak the rich" rehetoric he used in his later campaigns in the heat of the Great Drepression and the opposition to his legislation by the Supreme Court..
Medicare for All and Free Tuition for College students has a bumper sticker appeal until one looks under the hood as voters will no doubt do as the 2020 campaign rolls out. As a the Kaiser Foundatiion tracking poll shows (see my FB page) - once vpters realize their taxes will go up along with fhose of Big Pharma the lust to soak the rich will diminish by the realities that there is no such thing as a free lunch. Poliitcs is a balancing act. The devil is in the details. So while I'm happy to see the left dominate the narrative - once a nominee to run against Drumpt is chosen, the party will have to turn to the center or more moderate ways of fixing Obamacare et al. Those voters in Wisconsin, Michigan, Ohio and Pennsylvania which were keys in 2016. Which candidate can craft such a message to bring Dems and Independents into the fold? In 2020 be careful what you wish for you might get it! 4 more years of the Drumpt. A flurry of proposals to slap new taxes on the ultra-wealthy, extend Medicare to all Americans and make college debtfree reflect a rapidly changing Democratic Party that sees a sharp left turn as the path to defeating President Donald Trump. Some of the party’s top 2020 presidential hopefuls are wading into uncharted political waters to demonstrate their commitment to mitigating income inequality. But where party activists see an opportunity to excite voters, some veterans of past campaigns and moderate Democrats warn that the party wins elections not by indulging its most liberal impulses but by hewing to the political center. And Trump has made clear he’s ready to use the leftward tilt by Democrats as a wedge issue. Five U.S. senators with eyes on the Democratic nomination have endorsed single- payer health insurance, a government- guaranteed job, and subsidies to ensure Americans can graduate from college free of debt. Kamala Harris also wants a $3 trillion tax cut for families whose earnings fall under $100,000. Elizabeth Warren wants a yearly wealth tax on assets above $50 million. Cory Booker wants “baby bonds” for poorer kids to bridge racial inequities. Bernie Sanders wants a massive expansion in the estate tax. Democratic contenders are pushing tax hikes on the wealthy to finance an expansion of government programs. They’re also seeking to make good on the “Second Bill of Rights” that Roosevelt proposed in the 1944 State of the Union, one year before he died and the goal fizzled. “The things that FDR enumerated in that speech — the right to a living wage and job and education and housing and secure retirement — that’s big stuff, and you have someone on the Democratic side with legislation for almost everything on that agenda,” Kelton said. The Democratic hunger for more liberal policies was evident in the 2018 election as Reps. Ayanna Pressley of Boston and Alexandria Ocasio-Cortez of New York ousted longtime Democratic incumbents. PS: see analysis by EJ Dionne in my "comments" section. Socialism is not a 4 letter word anymore! Copyright © 2005, Russell A. Dondero. All rights reserved.